Shaun and I were out running errands this afternoon. He was listening to the classic rock station and giving me a mini-lesson about some obscure band that I was largely ignoring. We came to a stop light and he turned to give me his full attention. Apparently, I didn’t have very pleasant look on my face because he was suddenly very concerned and wanted to know why I was scowling. Of course I denied that I was scowling. I informed my husband that I was just thinking, and was also wondering when he was going to do something interesting. “Interesting?” he asked. “What do you mean, interesting? I’m always interesting.” I told him that while I was very happy with his confidence level, I needed something more from him than his vast knowledge of the band MouseRat or whoever. “Wait a minute! This is about your blog isn’t it?” he shouted and began waving his arms around in agitation. “This is too much pressure, I can’t do this!” I explained that he was all I had left now that the girls were rarely home. I needed him for some good blog material…especially as I had committed to blogging every day. And besides, I mollified him, he was the most interesting person I knew. Hmmm…I do find it interesting that somehow, the beard is still there and I’m writing about it. 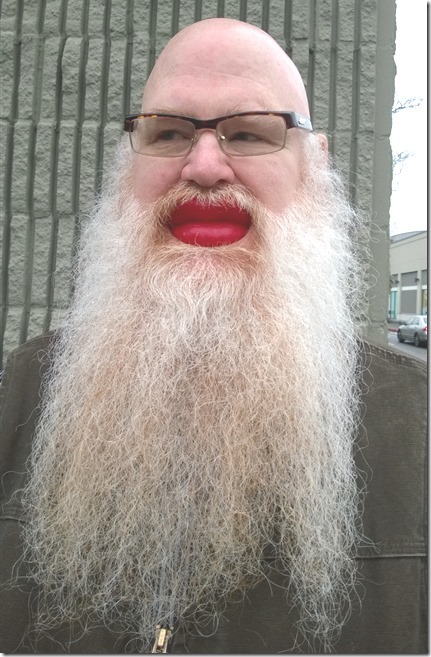 At least I get to post an interesting snapshot of Shaun wearing wax lips…. You really captured this scene. But I must say it was the photograph that added the “WOW” factor! I am interested in that story, especially when you told Shaun ” You know how I feel about that thing.” What is the rest of the story? Shaun is going to be so excited that people want to know more about his beard! Reach out Susan, write about some of your relatives. By the way, I love those lips, perhaps you could get Shaun to try different shades of lipsticks. Now that would be something…to share lipstick tips with my husband! By that do you mean weird? Some of my nieces and nephews have suggested that might be me. at least warn us..so we can use a heavier “poise” pad…I’m still laughing and I don’t always do this and yelling back and forth to the man in the livingroom who is like the old comedy routines..that you have to repeat twice so they get it…thank you both for the great blog and great lips…you two are funny kids…love you all..
Now you are cracking ME up! Hmm, Susan, I don’t think so, they just don’t understand me.